(1961) Joachim Fuchsberger, Karen Baal, Klaus Kinski, Andy Berber. 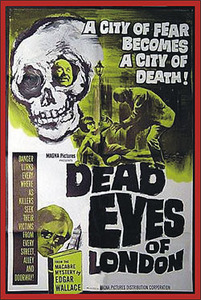 In the early 1960's a large number of German films came out based on horror stories of Edgar Wallace. This is one of the best, a remake of Lugosi's THE HUMAN MONSTER. A monstrous, blind killer is on the loose in London! Kinski's death scene is memorable. From 16mm.